For the first time in almost 10 years, researchers and the public will be able to get a glimpse of materials documenting the nearly 150-year history of the Corcoran Gallery and the Corcoran College of Art and Design—now the Corcoran School of the Arts and Design. The George Washington University announced this week that close to 2,000 boxes of historical documents and hundreds of thousands of architectural drawings, exhibition posters, photographs and oversized ledgers are now available at the Special Collections Research Center in GW’s Gelman Library. The archives, which were donated by the Corcoran Board of Trustees, are a living history of not only the Corcoran, but also the evolution of American art museums and art education over the last century and a half. "Archives are the primary source of materials that tell in original words what the history was at an institution,” said Geneva Henry, dean of libraries and academic innovation, GW Libraries. The ability to open the boxes and sift through the information to find connections is profound, and the archives are a tremendous resource for students, faculty and the community, said Sanjit Sethi, director of the Corcoran School of the Arts and Design. “This isn’t nearly 2,000 boxes of information—this is living history,” he said. “The future of the Corcoran, in part, lies within some of these boxes. It gives remarkable insight into what the true DNA of the institution has been and what it’s potential for growth is in the future." 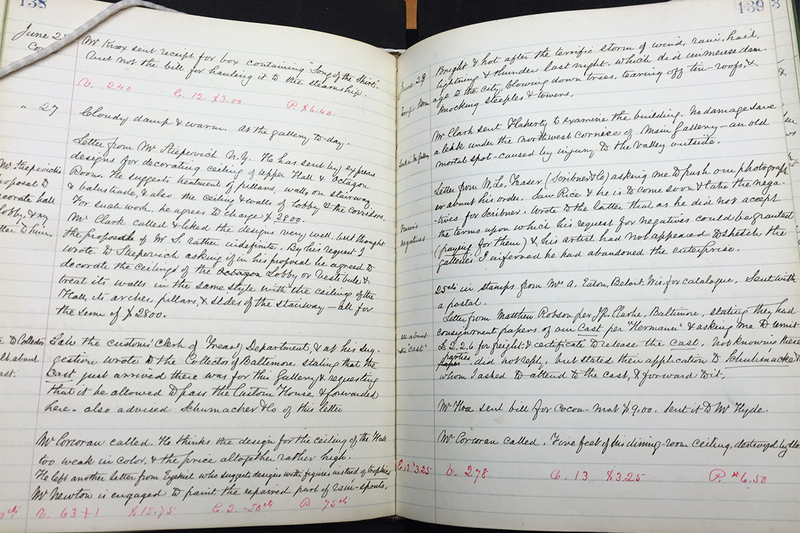 One of the noted materials inside the archives is a set of journals of William MacLeod, the first Corcoran Gallery curator from 1873-1889, who detailed daily activities as well as his opinions on works that were either offered to or purchased by the Gallery. MacLeod also detailed conversations with the Gallery’s founder, William Wilson Corcoran, and its board of trustees. An entry from the journal of the Corcoran Gallery's first curator, William MacLeod. The archives also contain drawings for a proposed Flagg building expansion designed by noted architect Frank Gehry and materials related to the planned 1989 retrospective of the work of photographer Robert Mapplethorpe at the Corcoran. “For a researcher this is an absolute treasure trove,” said Henry, who added that the library gets regular requests to access the archives from researchers, art museums, people searching for artwork created by relatives and many others. In coming years, the library hopes to digitize large portions of the collection and make them available online. To make an appointment to view the archives, please contact the Special Collections Research Center.